I like to keep Sundays as a quieter and simpler day. Although it doesn't always work out that way, an ideal week for me includes a day where I can shrug off the cares of the business at hand to take time to pause, reflect.... to look inward and upward. For a long time, I used to think the harried hurriedness of our society was just a malady of our fast-paced era, but after reading various accounts of people living in other times and centuries, it seems each generation faced, in its own way, the temptation to 'live too fast'. I'm reminded of what author Gordon MacDonald, said in his book Ordering Your Private World: "If my private world is in order, it will be because I have chosen to press Sabbath peace into the rush and routine of my daily life in order to find the rest God prescribed for Himself and for all of humanity." Today I wish you a gentle rhythm of peace... and time to relish the many blessings that have come your way! I was just telling my husband this very thing the other day. Having a day of rest, allows you to take time and notice all that is good in life. Today I'll go out and smell the roses, eat a leisurely breakfast and listen to the preacher and hopefully discover something new in the Bible that I never understood before. Tomorrow I'll be back to hastily downing breakfast, before weeding and canning (strawberry jam) and cleaning. Thanks for the good reminder, Brenda! It's so easy to get caught up in the frenzy of "doing". 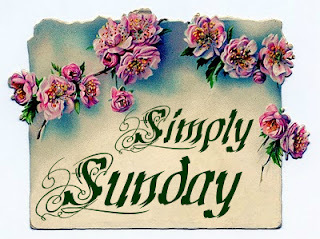 I love Sundays and the change of pace...time to refill my spiritual well. I enjoyed the prayer by Peter Marshall - very interesting. Happy Sunday and Happy 4th. Beautiful prayer! We definately do eed to slow down and take time to enjoy the things that life is all about and to show our appreciation to the One who gave us life to begin with. Beautiful! Thanks so much for sharing that today and reminding us to ....SLOW DOWN! !